So this is a twist none of us expected, me least of all. Looking back I realise that I got off D’Natalin too fast. You see, as soon as the Instructors at the diving school in Andratx realised that I would be working for them this season they decided that they needed me yesterday. Yes there was quite a bit of pressure to get off from both parties. Matthias kept calling and telling me that they really needed my help and asking how soon I could come. Meanwhile the atmosphere on D’Natlain was getting claustrophobic, certain members of the crew were already excluding me and ignoring the fact that I was still part of the crew. The next thing that started happening was my name was removed from the watch list even though I was still required to stand watches while in port. When I decided that I would be working at El Buceo for the following season I moved off D’Natalin and moved into Steven’s apartment, which, at that time was also shared with Matthias. Although at the beginning I felt out of place not being able to understand German and, of course the undeniable fact that I was the only female. During the course of the season, people came and went, moving in and out and, at one point we had four people living in the apartment. This arrangement stayed for most of the season and as work load and pressure increased four people living, and working under one roof became difficult. Everyone has good experiences and bad ones, I am going to focus on the good ones because, in the end, that is what I will remember when I look back at my season spent working for El Buceo. A normal day, if of course you can call it as normal. Mornings were always a little bit of organised chaos. Steven would be the first up, followed by Matthias or myself. The showers were almost continuously going with two bathrooms and three people. As I said before, by the time I was up, Steven had already been in and out of bathroom No.1 which, he shared with Matthias, and was either watching the TV or playing on his X BOX. When I was out of the bathroom I would wake Frank up, if of course he was not already banging on the door. While Matthias and Frank were getting ready I tried to get some breakfast into me. Normally Steven and I would have oats but as the season got busier breakfast comprised of fruit, eaten on the way to the car. Eventually leaving the apartment we all piled into the El Buceo van and drove to the other side of the port where the school was located. Matthias would talk to Olga and Lothar the owners about the plan for the day and proceeded to try and fit all the divers into one boat without having to make two trips or tow divers behind the boat. Frank went to Paguera, a little town ten minutes away where the dive school has a shop, and picked up guests. While he was doing this Steven and I were getting the bottles ready, bringing out gear and, if needed filled the inflatable boat with fuel. On occasion we would have another Instructor come with his own students. Fred spoke English, Spanish and French and was my saviour when I landed myself a group of French students. Because of the variety of languages spoken at the school we were able to teach in English, Spanish, French and of course German. We were also able to communicate in Russian because Olga was originally from Ukraine. Although it sounds like an odd language to have at a dive school in Mallorca you have no idea how many eastern European divers we have. Although most can speak English, hearing their own language makes them feel a lot more comfortable. Frank normally taught the Discover Scuba Divers, who were people diving for the first time. The reason for this was that most of the Discover Scuba Divers or DSD’S for short spoke German and on top of that, as can be expected, were nervous. Frank is a very easygoing person and students feel comfortable around him, because of this he was the best person for DSD’s and other divers that were new to diving or a little nervous. I also had my fair share of DSD’s because people were not threatened by me. I think it also has something to do with the fact that I keep telling them ‘If a blonde female can do it, trust me, anyone can’. This normally broke the ice and made everyone feel more relaxed. In the middle of the season when everything was really busy I found myself surrounded by nervous divers. The other instructors lost their patience a lot faster than I did, I guess because I don’t have to teach, I can easily say no and just lead dives with qualified divers. I enjoyed all the challenges that were thrown at me, the more difficult being the theory of two Nitrox courses and an Open Water Diver course with two boys in French. Open Water diver is an easy course to teach, the difficult part of course was the French part. I don’t speak French although; when the subject is diving I can read and understand a little if it is spoken slowly. Before I told you about Fred, the diving Instructor that was able to speak French. Well when we get a French course we simply call Fred up and ask him to come by and lend a hand. Well, this time when Olga called him, he was busy and unable to come and help. This was not a problem for Olga however and handed the course over to Matthias and asked him to sort it out. Matthias’s idea of sorting out this particular course was to give it to me. Nice, easy and, best of all, no longer his problem. I was able to communicate with the students via hand language and drawings but unfortunately the theory still had to be taught. We gave then their manuals in French and advised them to do a lot of home studying. 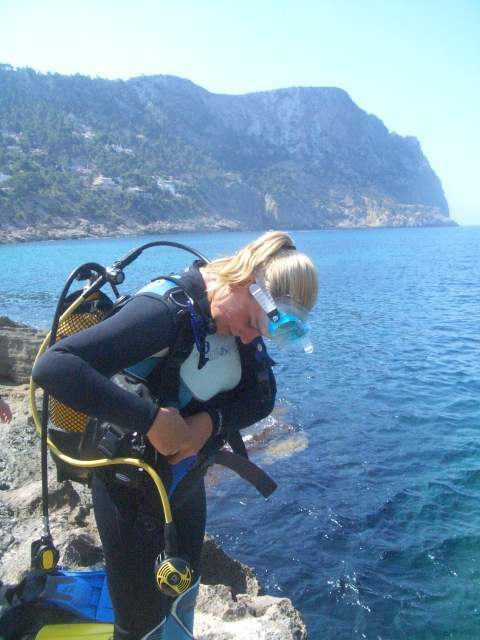 We have Open Water diver exams in three languages German, English and Spanish. The answer key in universal so I could mark a German exam by matching up the blocks. The only problem of course was explaining the mistakes. We had a French exam but it was out of date and we did not have the answer key so. My job for the next couple of days between everything else was, translating the Spanish exam into French. I did this by reading the first question in the Spanish exam and then reading through the French exam for the spelling of words. French and Spanish are similar so I could read a sentence in French and translate it into Spanish and vice versa. Our captain was able to speak and write in Spanish and, once the exam was translated I had him read through it and help with any grammatical errors and of course for him to check the answer sheet with the exam. He would read the question in French, tell me what it meant in Spanish. I would tell him the correct Spanish answer and he would tell me what the French definition of that word was. I am glad to say that both students passed, one with 76% and the other with 90%. Then came the difficult part and, with props, pen and paper I went through their mistakes and explained the correct answer. This was one of the most difficult courses I had ever taught. A couple of days after that Fred arrived with a new French exam and answer key. Better late than never I guess? During the season, besides doing other things I was able to complete a couple of specialty courses, which I was very happy about. It took a while to complete the courses, as I was busy with other things around the dive base. This season I was also able to complete my Dive Master Training, this was, by far the longest ten day course I have ever done. Because my Instructor was busy with other courses and as I was there most of the season, he was only able to teach me in his spare time, which was seldom. During my time at El Buceo I decided that, as soon as the busy part of the season was over I would fly to South Africa and visit family and friends. I left for South Africa on the 11th September, early on Monday morning. To say that I was ‘cutting it close’ with my exams would be an understatement. I wrote my exam at 11 o’clock Friday night finishing just past midnight. My exams were marked Sunday evening and I left the next morning at 6 o’clock.